On May 1st 1998 the first Apprenticeship Centre Contracts commenced. 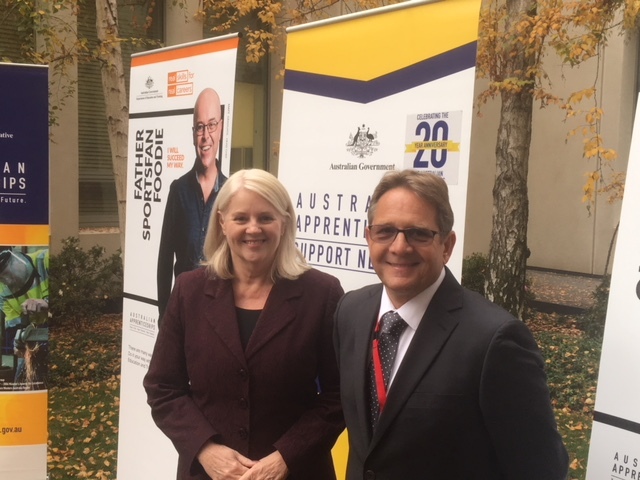 Today in Canberra we celebrated the 20 year anniversary with Assistant Minister Andrews, Apprentice Ambassadors and a number of invited guests. Over the last 20 years the network has assisted 4.7 million Australians into apprenticeships and traineeships. We’ve determined the eligibility for $9 billion worth on incentive payments to employers and apprentices. Each year we place an average of 235,000 people into apprenticeships, activate and monitor their training contracts, provide gateway recruitment services and mentoring through our In-Training support. We are the quiet achievers of the VET sector having multiple touch points with every apprentice in every jurisdiction across all vocations in Australia. Here is the speech we gave at Parliament House today.